A comment about one of George White’s photos. A comment for Mark White about one of his father’s photos featured on this post. 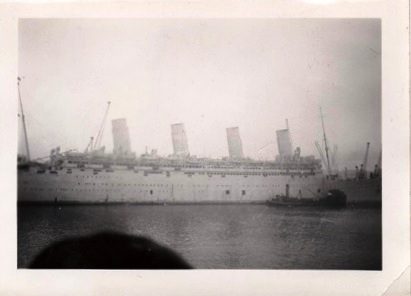 In response to your readers request for anything on the refitted Queen Mary as a troop ship, I have a few pictures from my dad’s collection to share. I apologize for the quality. They aren’t that great – it may have something to do with the Southampton fog. 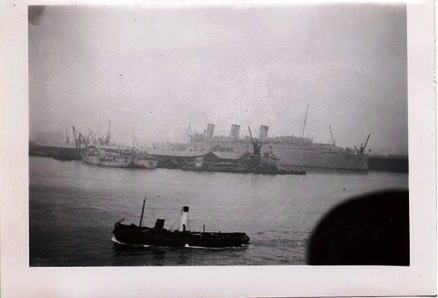 Although my father did not sail back to Canada on the Queen Mary, it must have been an impressive sight in the harbour. My father sailed back to Canada on the New Amsterdam. 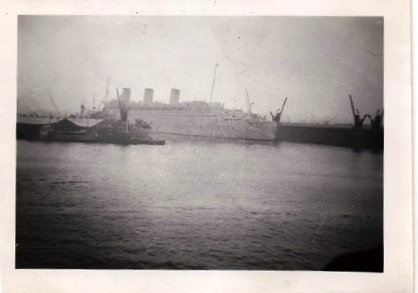 She was also quite an impressive Dutch ocean liner that was also pressed into service as a troop transport during the war. I’m sure it was every bit as crowded as the Queen Mary during voyages. 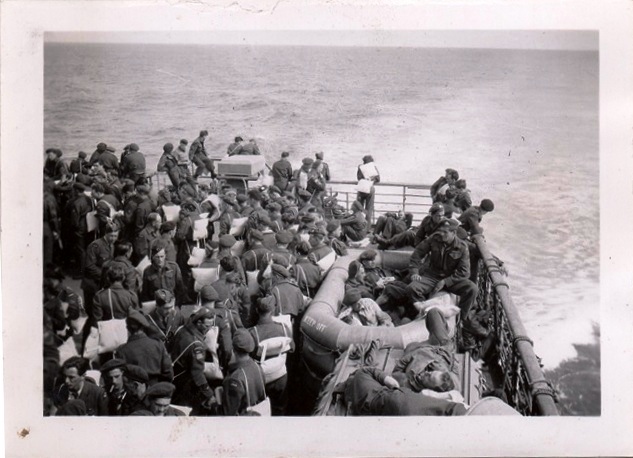 I’m including a picture of troops packed on the deck at the stern of the ship. Captions are as on the original photographs. Stern of the New Amsterdam (Move over and give me more room). Dr. Mark Celinscak had contacted me a few years back. He wanted to get in touch with George White’s son. I am grateful that so many of you offered me your generous support over the years. I only hope you will excuse this mass email. I most sincerely appreciate the encouragement and kindness I have received. I am pleased to inform you that my first book will be published late next week (see attached flyer). The official publication date is 24 October 2015. 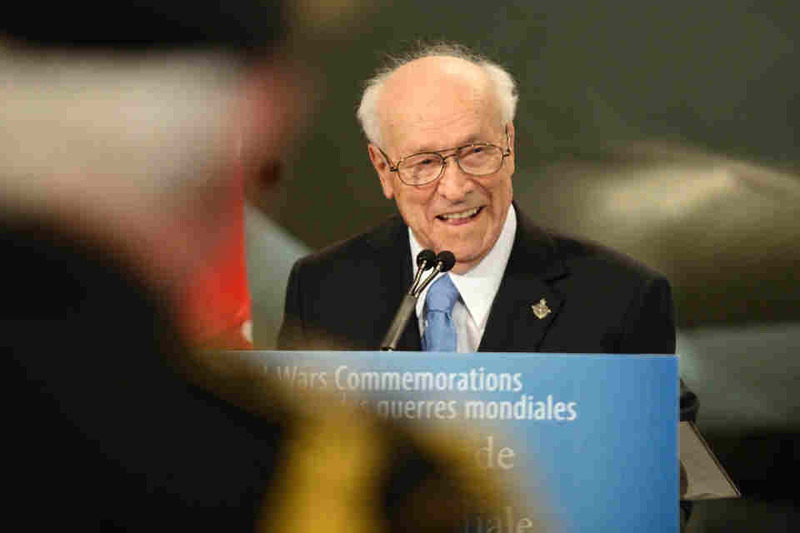 The book is titled Distance from the Belsen Heap: Allied Forces and the Liberation of a Nazi Concentration Camp (University of Toronto Press). It examines the experiences of British and Canadian military personnel during the surrender and relief of the Bergen-Belsen concentration camp in northwest Germany at the end of the Second World War. HEW Lecture: Thursday 5 November 2015 at 7:30 p.m. at Beth Lida Forest Hill Congregation located at 22 Gilgorm Road, Toronto. Free and open to the public.Montreal Holocaust Education Series Lecture: Sunday 8 November 2015 at 7:00 p.m. at Le Dépanneur Café located at 206 Rue Bernard Ouest, Montréal. Free and open to the public.The book will be available for purchase at all three events. While it would be wonderful to see you at one of the public lectures, I understand if you are unable to attend. I am pleased to say that the book is now available for pre-order at a number of online retailers, such as Amazon, Amazon Canada, Indigo-Chapters, Barnes & Noble,Waterstones and the like. In closing, I hope you will excuse this blatant act of self-promotion. But, after nearly ten years of work, I am eager to share this news with as many friends and colleagues as possible. If you know of anyone who might be interested in this work or the upcoming public lectures, please feel free to forward this email. More on the 43 year-old Spitfire pilot here. George White, Mark White’s father, kept a journal during WWII. Mark is now sharing a new article he just wrote using this journal for our new honorary member. I think John Le May will like this one – lots of details. When you do your own research on Robert Stanley Weir you will find some interesting stuff. I’ll keep you in suspense and let you do your own homework! I wanted to share the story about the surprise visit of Winston Churchill to 403 Squadron on July 22 1944 with John Le May. It’s a really good story, but I got sidetracked with another great story. I will share the Churchill story later. 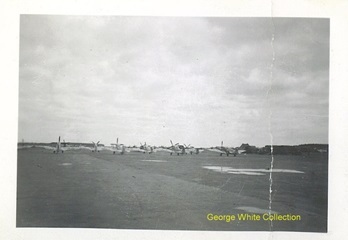 While going through my father’s notes, pictures and the journal, I came across the story about a 43 year old Spitfire pilot attached to 127 Wing. The maximum age for Spitfire pilots in operations was apparently 28, but Squadron Leader Pilot, Ronald Stanley Weir was 43 years old. It is not a happy story. He was killed while landing a Spitfire on 403 Squadron’s landing strip at Crepon Normandy on August 6 1944. 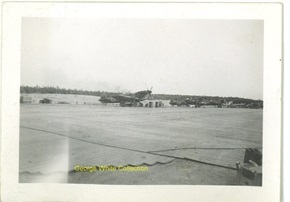 127 Wing (Airfield) consisted of 403 Wolf Squadron, 416 Lynx Squadron, 421 Red Indian Squadron and 443 Hornet Squadron. D-Day was June 6, 1944. 403 Squadron landed on Juno Beach on June 18, 1944. 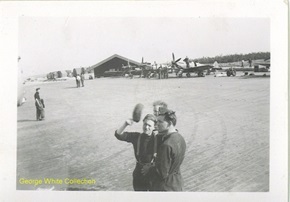 127 Wing was at Base 2 Crepon, France from June until August 27, 1944. 403 Squadron operated out of an open grass field along a hedge. Maintenance was an area in an apple orchard close to an abandoned German fort consisting of earth banks with old German WW I field guns set up to cover sections of the beach. Since landing in Normandy, 403 Squadron was involved in air to air battles and ground attack missions. These men witnessed some of the greatest military battles in history. The war was all around them, and the front was only a few miles away. Weir, Ronald Stanley SL(P) C1651 from Westmount, Quebec. Killed Aug. 6 44 age 43. 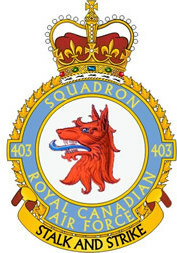 #416 City of Ottawa Squadron (Ad Soltum Paratus). SL. 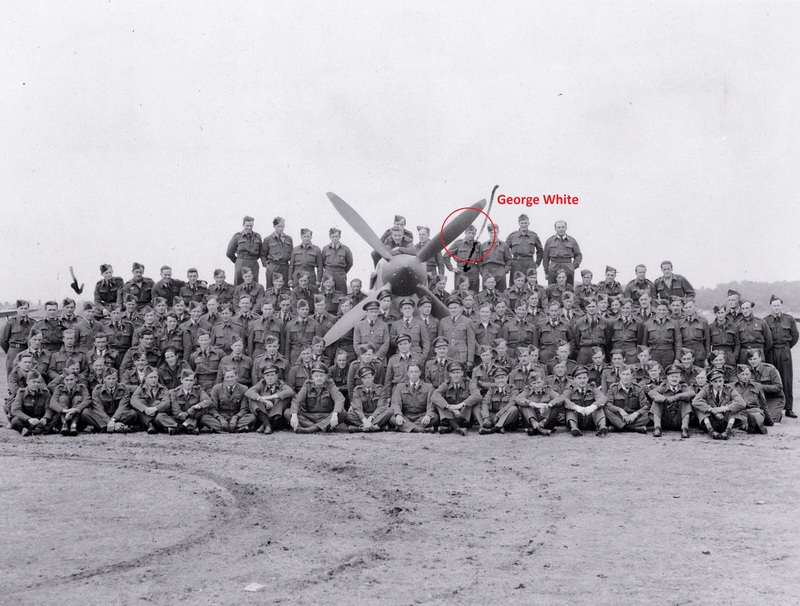 Weir was flying Spitfire aircraft # MJ 741 and overshot the landing strip a Crepon, France. He turned the aircraft to port but it went into a spin and he was killed in the crash. Squadron Leader Pilot Weir is buried in the Canadian War Cemetery at Beny-sur-Mer, France. Although Weir was killed on August 6, 1944, the story will begin on August 5. 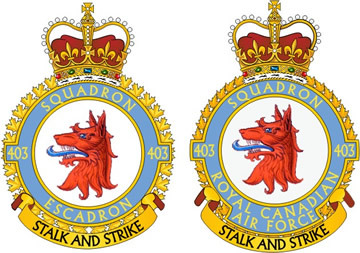 It will cover the activities of 403 Squadron’s ground crew until August 20, 1944. The details about the war, and the details about the No.1 Crew’s activities during this period are just too numerous and too rich to exclude from the story about Ronald Stanley Weir. Working late again. Don came back again and brought me a good 8 mm German Mauser rifle. This looks like a good one to try and get back home. Our Spitfires are a big attraction for the Army. We got another visit from the Legion Canteen – afternoon tea this time. Not a busy day, small inspections and other minor problems. Went out to see if I could find Don in the evening and had a little trouble getting to Reis, finally got a hectic ride on a motor cycle. Found that Dons 12 Field had just gone back to the front again. When I got back to camp I heard that Flt. Lieut. Weir, Test Pilot for Maintenance, had just been killed in a crash. He was an interesting story. He had a big job with the RCAF in Canada – in charge of purchasing fuel supplies for the RCAF. When a ruling came in allowing Ground Crew Officers that could pass medical requirements to take Aircrew Training, he got his Wings and went through O.T.U. as a fighter pilot and got posted to our Airfield. But he was over 40 years old, and fighter pilots had to be under 28 years old. So here he was in a Squadron and was unable to fly on operations, so he promoted himself as Test Pilot for Maintenance so he could check out the repaired aircraft before they were returned to their Squadrons. He always made sure the test aircraft always had fully loaded guns with the hope that some German aircraft would come by. When a Spitfire Squadron lands, it’s like ducks, they come falling out of the sky and make basically three point landings that don’t take up much runway length. The American pilots on the other hand, were trained in Texas, with long runways and use a less steep approach. We nearly always had a crashed American plane visitor that over ran our landing strips. Well, Weir was coming in to land when a squad of Spits, short on fuel came rushing in. He was already committed but aborted his landing so he wouldn’t get in their way. He didn’t have flying speed and hit the ground hard enough to kill himself. 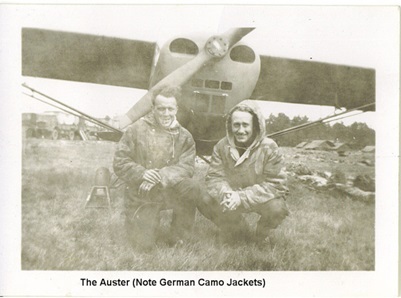 We were all sad to see him gone, he had taken quite a few of the gang up for flights in the Auster that replaced the Tiger Moth that Beurling wore out. About 8:30 PM American B 26 Marauder – 2 engined bomber – came screaming in on one engine and lined up to crash land (wheels up), on our netting. He was immediately waved off with red flares – he staggered on towards the beach and crashed in a gulley. Whitey and I ran about half a mile after him to see what help was needed. By the time we got there, there was a tremendous fire. They had crashed into a fuel dump belonging to a Polish Tank Outfit. The Poles were going crazy trying to save as much gas as possible, forming lines, handing hot Jerry cans from the fire from one to another. We climbed into a shell hole on the side hill (likely made by naval gunfire) to watch developments as the center part of the fire burned out. The aircraft bomb load was exposed right in the fire. A small 1500 wt. British fire truck drove in. The crew, was dressed in asbestos suits, jumped out and started spraying foam on the bombs. We took off – no explosions occurred and the fire gradually died out or was put out. How those Poles handled these hot cans without getting severely burned is amazing. It showed how determined the Poles were to get back at the Germans who had devastated their county. If that aircraft had exploded on our netting ??. The crew must have perished in the crash unless some had bailed out beforehand. They must have been in a real panic. Another engine change, we now hold the unofficial record for the fastest engine change in the field. All the engine bolts have a small hole through the head. When it was tightened down, locking wire was attached to keep from coming loose. Slow awkward system but it works. Anyways, we beat the RAF record times we had on hand. We had a funeral today at Bény-sur-Mer, the Canadian Cemetery, for Flt. Lieut. Weir. He had a real coffin. I was a pallbearer. When I got back I took my German rifle and fired a few rounds. It works fine and is very accurate. Americans are on the move and making good news. They have captured Lorient and St. Nazaire. Canadian 2nd Army holding the Panzers. Canada has its own official Army now, their Air Force backing consists of the International Fighter Squadrons. The Canadian Squadrons are with the 2nd Army. Finishing up another engine change today, not much else coming in. Nice weather during daylight but damp and foggy at night. Jerry hasn’t bothered at night lately. Guess he doesn’t like the full moon with night fighters around. Spits are not used at night. Work picking up again, means our aircraft are getting more action. Bob Askig Cpl. has now joined us. He’s a likeable sort and he fits in well. DN-Q – another dandy mess. Tail end well shot up, pilot was lucky to get it home. Rumours that leaves are coming up, and say No. 1 Crew is in the lineup. Expect it’s the rumour mill at work again. Some guys are still hopeful that the old Burma rumour mill comes to pass. Finishing up DN-Q – was a very tough job for field conditions. Pilot was really happy to get it back. On night guard. Jerry air raid, a couple of bombs dropped, terrific Ac-Ac fire. Lots of flares dropped, mostly over the beach areas. Army is in another major attack, Canadian casualties mounting up. Day off. Writing letters and trying a little sun tanning. Americans starting to make advances through a lot of relatively open country. The pincher operation seems to be working. Germans really catching it. Word is the Germans have come out in force travelling in daylight trying to escape before the door closes. This is what we have been waiting for. Our aircraft are ready to really hit them hard now. Went to M.O. with grindings in my eye. He had to freeze the eyeball to get them out. Our aircraft running wild, dropping their designated bombs and strafing and blocking roads. Germans are in a real retreat – not a withdrawal. Another tough stern job on old friend KH-S, lucky to have made it back. Flights going crazy, aircraft coming and going, needing fuel and ammo, it must be hard to keep track of the score. I got called up to get a crashed Spit off our netting, his undercarriage had collapsed on landing, everyone in vicinity seemed overly excited. The crane truck came in, the crash crew got the trailer ready. I pulled the engine cover off and hooked up the crane cable, and signalled the operator to lift slowly. As the aircraft lifted and the wreckage underneath became exposed, there was a 500 pound bomb starting to dangle. I stopped the lift immediately and told the operator to hold it there. Evidently the pilot couldn’t shake the bomb loose, there was a hitch in the dropping mechanism. So he tried to bring it back, make a less than perfect landing. He must have been in a real panic landing with a fused bomb when the undercarriage failed and he skidded in on the bomb. I got one of the crash crew to run for MacIntosh, our Cracker Jack armourer. He had joined the army when he was 16 years old and was shipped to Britain with some of the first Canadian Army overseas. His mother had complained, he was discharged and was sent home with an excellent Army training. He then joined the RCAF as an Armourer. We were certainly free of spectators, the word had spread fast. Mac pulled the correct bomb panels and in a couple of minutes the bomb was diffused, the crane operator wiped the sweat out of his eyes, I waved the crash crew in. We lifted the plane clear of the bomb, they pushed in the trailer and I took off back to work. No one from Headquarters or Airfield Control ever mentioned it to me, they had been in contact with the pilot and knew the plane was landing. I bet they were all hiding in their slit trenches. If that bomb had gone off, our netting loss would have really spoiled our fun and saved a lot of German lives. Jerry aircraft are getting a little more active at night again, they don’t seem to be much help for their army, we certainly expected them to put up a much better show then they have. Perhaps the Russian Front has used up more German aircraft than was realized. Ground crew won’t complain. We took a truck into Caen to a factory to see what useful we could scrounge but the Army said NO WAY. Dust is really getting heavy again with good weather. Aircraft are going all out. Pat sent me some magazines in the mail. Wrote another 7 letters – all short ones. Some travelling show called the Tarmacs came in today. Something blew up near the mess, made a lot of noise. Some German long range shelling nearby. We could feel the ground shake. Wonderful weather. Aircraft still returning with empty guns. Germans in a trap. Our aircraft ceased flying at noon – too many aircraft over target areas. Fairly busy day. 127 now has the record for the number of sorties flown in one day. 403 has lost 8 aircraft in the last two days – we got 68 trucks today. This was the greatest day in Airforce history – German 7th Army literally destroyed. Started work at 4:00 AM and worked till 8:30 PM to keep our aircraft flying. Our C.O. Hamilton actually congratulated us – normally we rarely see him. Heavy rain, not doing much today. Quite a few new aircraft in, doing acceptance checks on them. These are brand new aircraft. We now hear a rest system has been devised – this isn’t a rumour this time. Camp has been set up near Bayeau – mainly for sleep. Easy day made another tool box or trunk from ex German ammo box. Whitey left today for a 5 day rest period, he sure earned it. American tanks reported close to Paris. Written two years ago when Mark White was just thinking of writing about his dad George White. We have come a long way since then. A new collaborator and a new category. 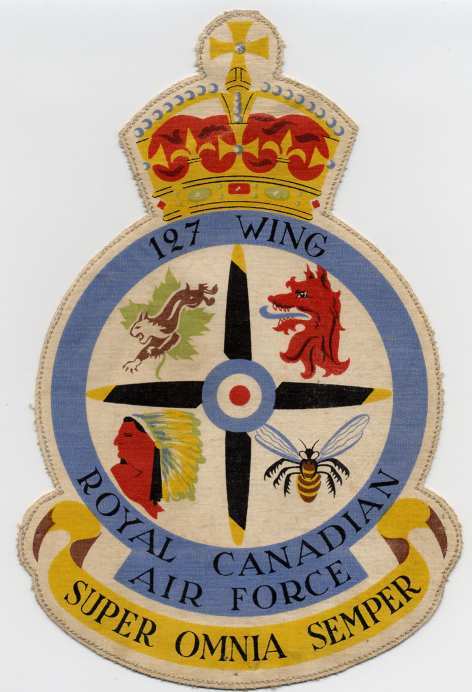 This blog pays homage to all those who served with RCAF No. 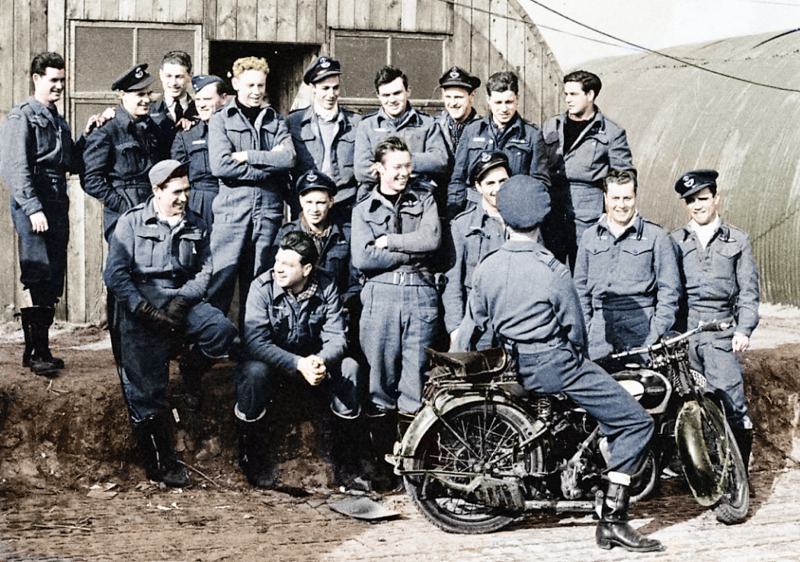 403 Squadron during WWII. This blog is all about sharing. 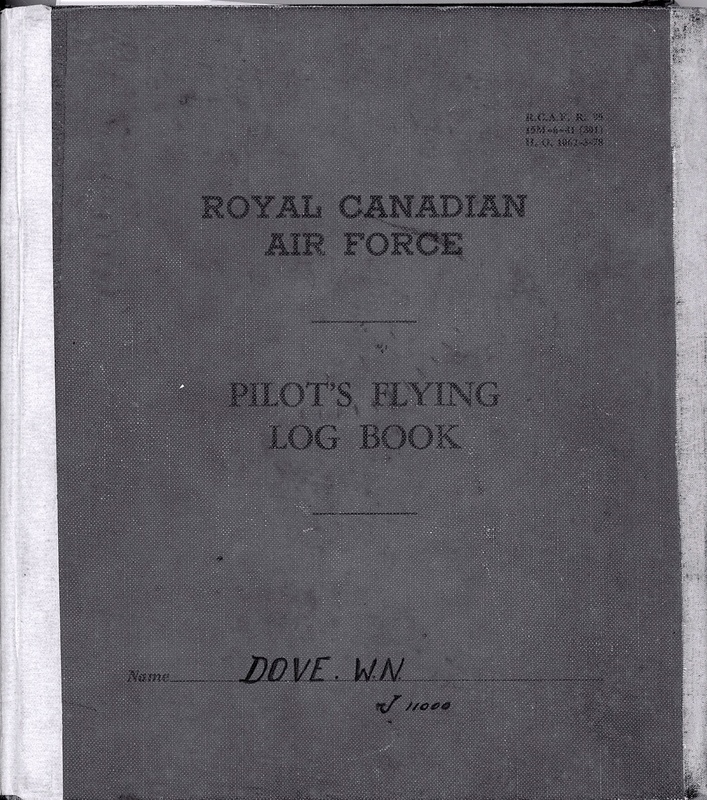 Greg has shared his grandfather photo album and his precious logbook. This is what George Stewart said about erks when I asked… Click here. 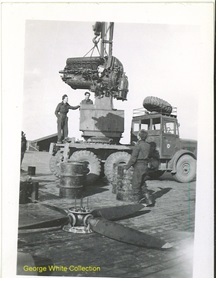 So next time, on this blog, we will talk about Mark’s dad who was an erk with RCAF No 403 Squadron. Click on the image to zoom in. Mark’s father should be there. Maybe you have missed that part of yesterday’s post. Mark has copied what his father wrote in his journal. Not only this time, but everything he has shared with us since 2012. One more reason to repost what Mark wrote so John can easily find Mark’s articles about his father and the real story of erks with 403 Squadron. Unless something comes up that I have to scramble and share immediately.